My selection of pentacles are detailed, accenting a certain motif, design or purpose. By request I have created a large pentacle: simple basic and bold. The star itself is not woven, no defining marks denoting a purpose; just a simple star as you would find in the Pentacle Suit of the Tarot. This two inch piece is flat on the back, the ring around the star is shaped with a good reflective curve. 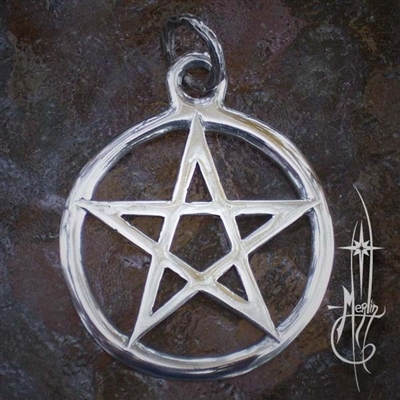 please visit the Large Pentacle page.